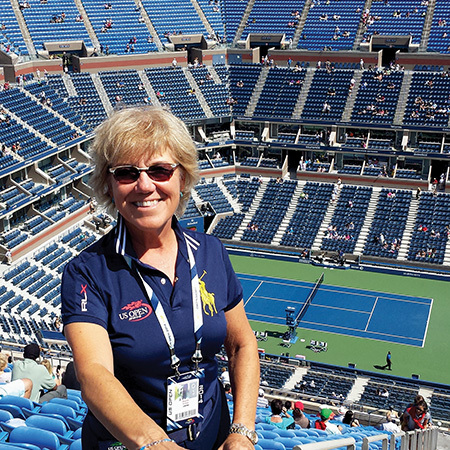 Maria Long, a line umpire, in the stadium instead of courtside at the U.S. Open in 2014. Garner, homegrown stars in the world of tennis officiating. Long, a line umpire, and Garner, a gold-badge chair umpire, are residents of Tallahassee who have trotted the globe as officiators. Here’s a look at how the two umpires got where they are today. Maria Long spends weeks away from home, watching players send fast-flying tennis balls speeding across courts. She focuses intently when the ball lands on thin, neatly painted white lines. And she knows the next move could be hers — determining whether the ball is “in” or “out” of bounds. It’s not the most relaxing way to enjoy the game, but Long relishes her role as a tennis line umpire, officiating at matches that may feature college students or superstars. Regardless of who’s playing, she can count on her concentration, calm demeanor and resolute attention to detail. And then there’s her understanding of the game. Long played a bit for Rickards High School but didn’t pick up the sport in earnest until after college, when she met her husband, Bill, a tennis enthusiast and surgeon. Now a proud grandmother, 66-year-old Long has been playing doubles in the South Georgia/North Florida Women’s League since 1974. In 2000, Long heard about training for umpires for college games, and she decided to give it a shot. In the past seven years, she’s branched out. Along with officiating, Long has started training others to be line umpires, and she’s working as a chair umpire for college matches, which take place from January through March. Long’s officiating lineup has included Wimbledon, the U.S. Open and the Australian Open, among many other professional events. One of her favorite events has been the Davis Cup, which gives professional tennis players a chance to play as a team, representing their country in an international competition. The Davis Cup is the men’s tournament, while the Fed Cup is the women’s. Aside from playing tennis, Long and her husband of 42 years spend a lot of time on their farm in South Georgia. She’s an avid hunter of quail and ducks on their 400 woodsy acres of land, and she’s also a fly fisherman. As a gold-badge tennis umpire, Jake Garner has traveled to more than 30 countries and officiated at some of the world’s top matches; but on a sunny afternoon in Tallahassee, he was back where it all started. “The first event I ever officiated was here, at a satellite tournament,” said Garner, overlooking the courts at the Forestmeadows Parks & Athletic Center. That event was in 1996, when Garner was just 16. Garner said he had been an “average, at best” tennis player on the Marauders team at the Maclay School when he walked into Forestmeadows and noticed a flyer advertising a tennis certification school, with the prospect of officiating games for Florida State University and FAMU. Garner became certified when he was 15, but he wasn’t able to jump right into umpiring college games. Garner was quickly captivated by the world of professional tennis and was recognized as a top rookie umpire in 1998, a year after his first trip to the U.S. Open. At that time, he was given the Jr. McGovern Award, which is only presented to a worthy younger official with great potential. “This” is a journey that has taken Garner to the top rung of the officiating ladder, as a gold-badge chair umpire. In the tennis hierarchy, umpires progress from white badges to bronze, then to silver and finally to gold. Confident, calm and even-tempered, Garner is one of eight gold-badge chair umpires under contract with the United States Tennis Association and one of 28 current gold-badge chair umpires in the world. In 2012, 14 years after being honored as a junior recipient, Garner again received the John T. McGovern Award, which is also given to a chair umpire or line umpire for a lifetime of dedication to and service and expertise in tennis officiating. Garner has officiated some of the most important tennis tournaments in the past two decades, including the 2007, 2009, 2012, 2013 and 2014 U.S. Open men’s finals; the 2011 and 2015 Australian Open men’s finals; the 2010 and 2016 Wimbledon men’s final; and the 2008 Olympic Games men’s singles final. He was also the umpire for the U.S. Open women’s doubles in 2015. “He’s one of the very best in the world, because that’s who gets to do that,” said Vogter, in reference to Garner’s impressive list of officiated tournaments. Garner lost his anonymity in a much-publicized match between Roger Federer and Juan Martin Del Potro in the U.S. Open in 2009. Federer was fined $1,500 for swearing at Garner during his final defeat to Del Potro, using a profanity that was picked up by microphones on the court for the live broadcast of the match. It all comes with the territory of sitting in that “hot seat,” overseeing all that happens in the game. Chair umpires “are the guardians of the Rules of Tennis,” according to the International Tennis Federation. That’s the case even when it’s an epic tennis battle like the one Garner officiated between Rafael Nadal and Fernando Verdasco in 2009, when the superstars played for five hours and 14 minutes at the Australian Open Semi-Final (Nadal won). “It was just a fantastic match,” said Garner, who finds that the atmosphere and the “feelings around the match and not necessarily the match itself,” can make an event memorable. It all leads to “the best tennis,” he added. One downside to umpiring is the time spent away from his family: Kelley, Garner’s wife of 13 years, who works as a medical insurance company claims manager, and their two daughters, ages 9 and 4. He’s also an achiever — so he returned to school online, through Tallahassee Community College, and then through the University of Florida, earning a degree in business administration. Those who haven’t seen Garner in years will also discover that there’s less of him to see: He dropped 75 pounds by walking and counting calories over an eight-month period. “I’d walk for hours, but I could never get my head around running,” he said.